A CHRISTMAS GIFT FROM MY MOTHER, RALEIGH, NORTH CAROLINA, DECEMBER 1995? Thomas Sayre was commissioned to create an installation for the atrium of the Penta Hotel in Istanbul, Turkey. He chose a theme based around the concept of falling leaves... the atrium of the hotel would contain a series of these leaves, made of fibreglass, suspended using metal wires, and lit from within. This work is a model that shows the three-dimensional shape of one of these "leaves". 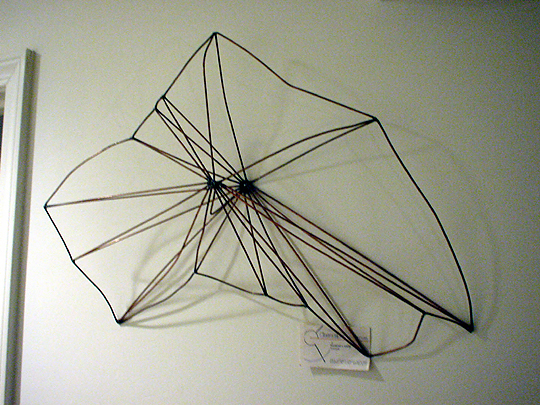 Although the card that came with this work indicates that it is made of copper on steel, I somehow get the idea that wire coat hangers were dismantled and used as the basis for the work. The wires are soldered to each other where they meet. The shape of this work very much reminds me of the shape of the island of Oahu, in Hawai'i, where I lived once upon a time and where my sister Lee was born. You can see the end result of Thomas' work by clicking here.